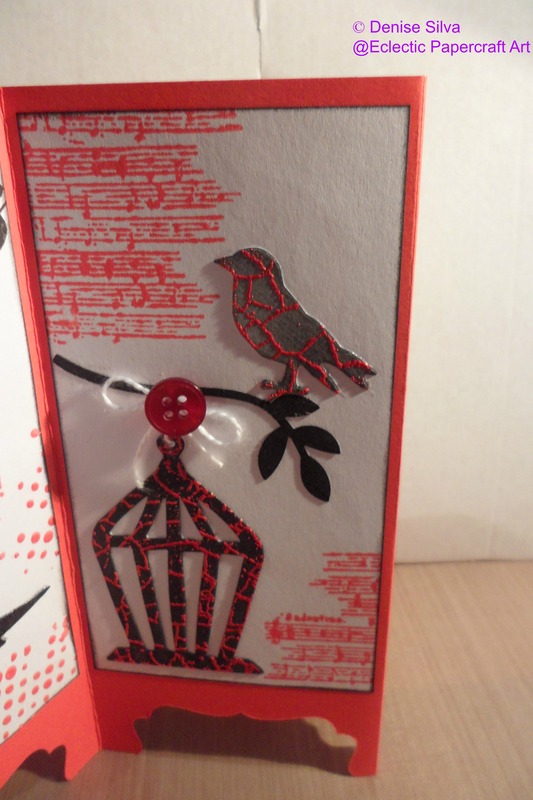 This card is my entry to the Vandicrafts Artistry Challenge #15: Bye Bye Birdy. What I had in mind was slightly different, I could swear I had a stamp that said “you’re nuts about”, my mistake, so I had to make some alterations to my plans and this was the result. It was already dark when I finished, much is not needed for that now, it was about 4pm… Anyway, I didn’t feel like dragging the furniture to my bay window to take a better picture. I would need to drag a chair, the craft lamp, the handyman electric extension to connect the light… I’m already tired! So I took the pictures on my craft table, I hope they are not that bad. For the first panel I used a stamp by the Stamps of Life and DIY texture paste with the 6×6″ stencil template Birds of a Feather. 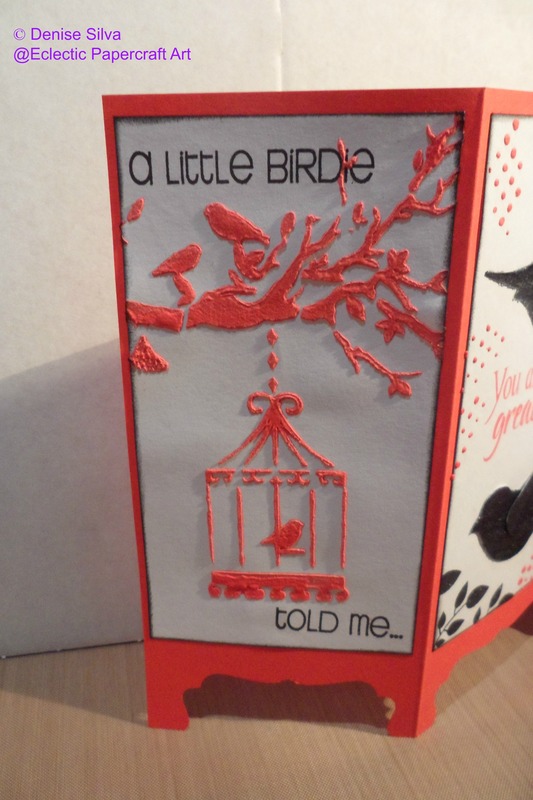 For the second one I used the bird builder punch (by Stampin’ Up! ), covered with clear crackle paint, the leaves and the sentiment are again from the Stamps of Life, and I also used the texture paste with a stencil Zoe had sent me a while ago. 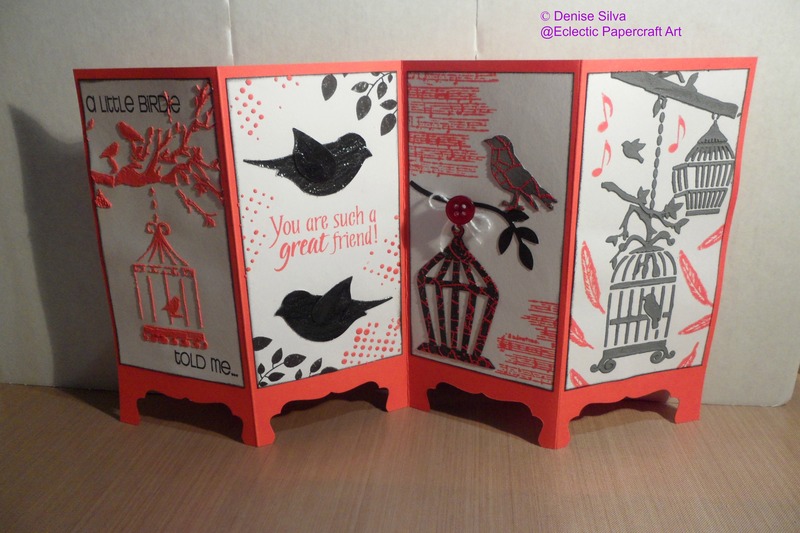 In the third panel I used the bird and cage from the Tim Holtz die (also courtesy of Zoe) and the branch is from the bird builder punch. 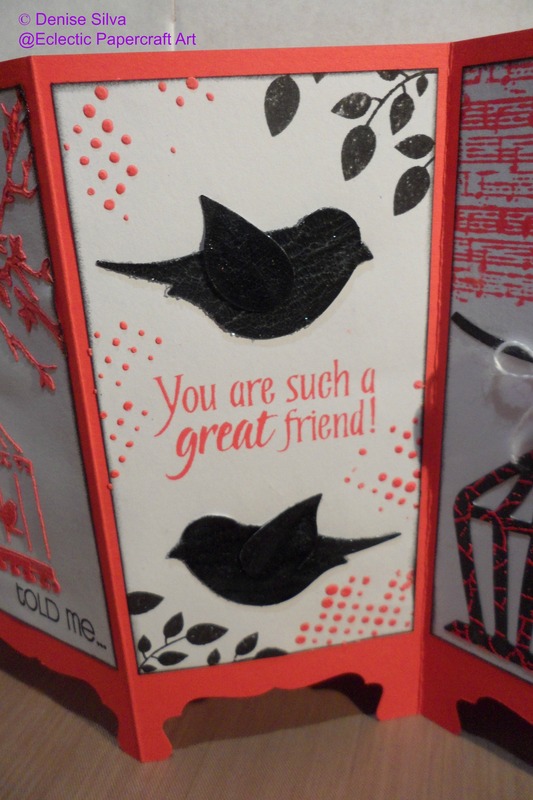 I used the Cracks & Specks stamp set (by Tim Holtz) with embossing powder. The music stamp is from the It is written stamp set (by Bo Bunny). For the last one I used the same stencil, again with DIY texture paste, and the Vintage stamp set (by Crelando). 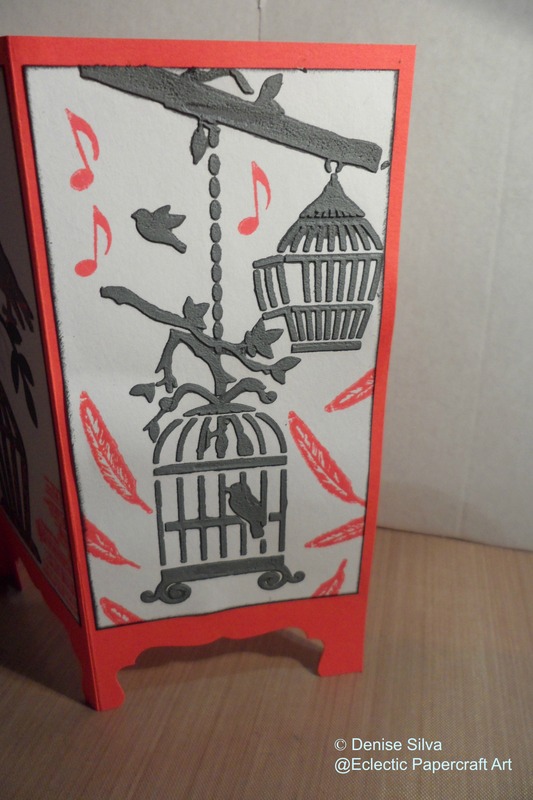 This entry was posted in Cards and tagged Handmade card, Japanese screen card, Vandicrafts Artistry Challenge #15: Bye Bye Birdy. Bookmark the permalink. Super project Denise. Each panel is a mini work of art in itself. Lovely composition on each piece. Same here, I probably end up with a stack of cards and take pictures in the weekend when my partner can keep an eye on the kids as well. I was thinking about buying a home studio photobooth set (a small one, for about 20 euro’s I think, quite cheap) but I’d need space to put it down. I don’t see myself unpacking (and more precisely, packing) it again for a single card. I would need room for it, but I prefer to use the room I have for crafting supplies/finished projects ;). Back to you project, I agree with all Florence said. 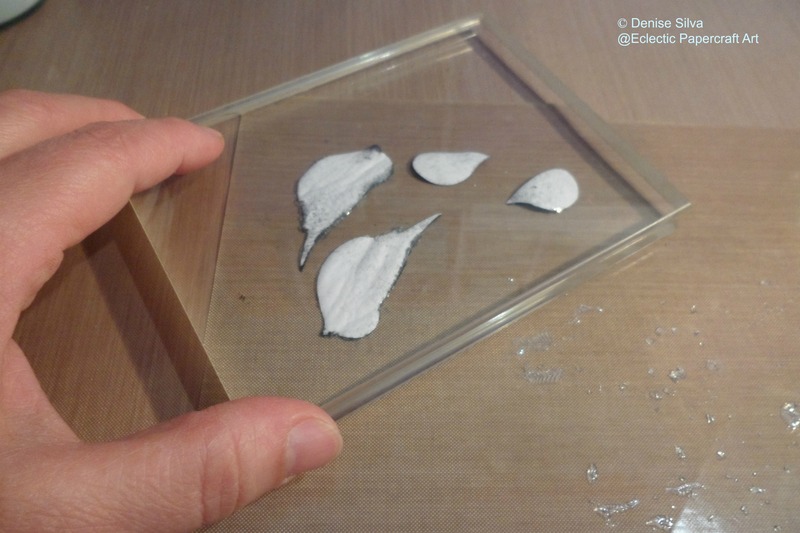 And as soon as my modelling paste is used up, I’ll make my own as well. Before we moved I had a square glass shelve (from Ikea, they came in pairs and we only needed 1) which I had laid on my crafting drawers and had put a salt lamp on it (very heavy). I regularly used it to flatten cards / cut outs, worked well. I was about to say I have no space for it now, but in fact, I do….I should put it back there! Thanks also for sharing how you make your journalling pages! Debbie I no longer believe in buying anything I can do it myself, so here is an excellent alternative to the store bought photobooth set ( http://www.wikihow.com/Create-an-Inexpensive-Photography-Lightbox ) I have 2. One with white background and one with black. My problem are the lamps, I can’t find proper white lights. Pay attention to the size of the box, if too small the sides will show. The reason it wasn’t back in it’s place is that the space was allready taken :P. The drawers now stand alone, and the glass shelve is slightly wider then the width of the drawers, I’ll have to check if it’s safe enough. We have a good camera, and that helps a lot, but lights would be a problem here too. Aren’t led lights good enough? 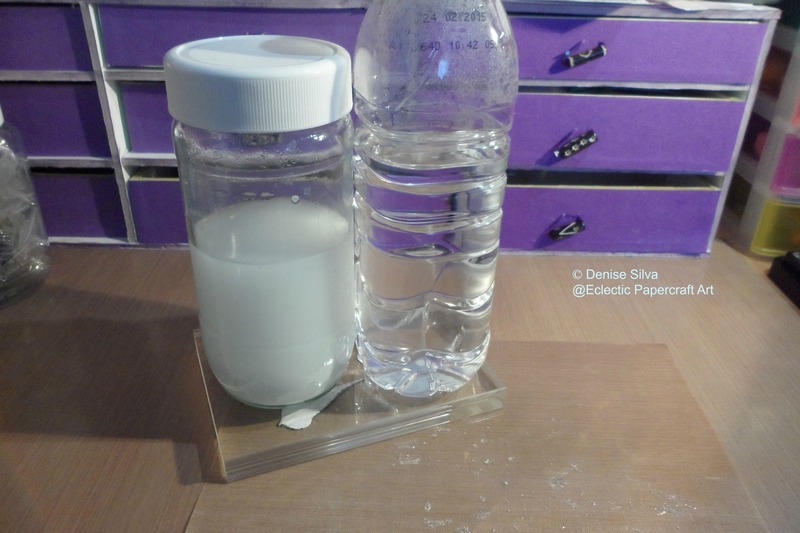 I’m not even on 3/4 of my current jar of texture paste, and I’ve had it for about a year…. I don’t use it very often / not often enough, so I got plenty of time to read the recipes and trial and errors of others ;). I bought the lamps with the led bulbs, but they are yellow rather that white, and I can’t find the whites to replace them. Oh well, one of this days I’ll take this more serious and get a better system lol. No worries, I understood it as bulbs. 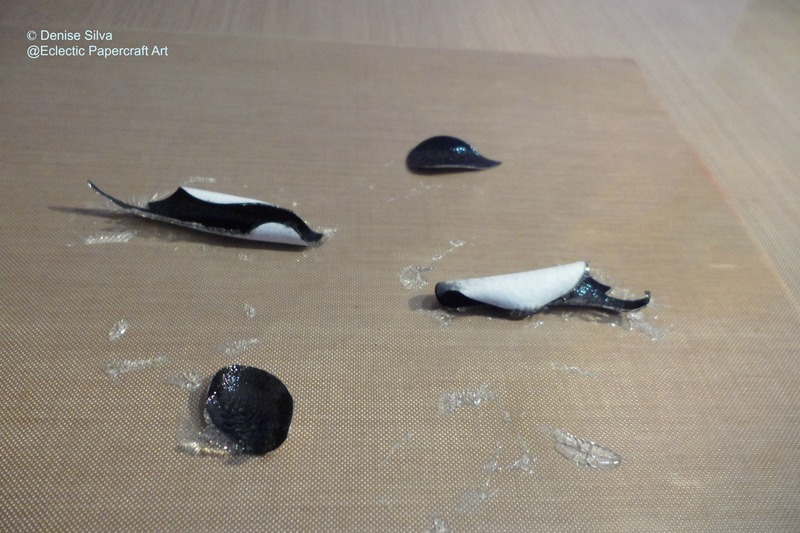 I realized a few days ago the main reason that I didn’t put that glass plate back: the light of the spot where the drawers are is terrible – in between two windows, and behind the windows is a (transparant) porch roof.